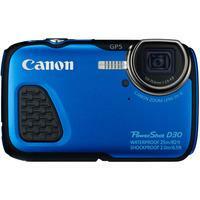 The Canon PowerShot D30 Digital Compact is an underwater, all-weather camera and combines a large 12 megapixel sensor with a 5x optical zoom lens. Waterproof down to an impressive 25m, shockproof to 2m and freezeproof to -10deg, the Canon D30 is highly suitable for the travelling photographer and more than capable of handling any outdoor activity you wish to explore. What's more, the Canon PowerShot D30 offers built-in GPS which tags the location of each photo, a 3.0" LCD screen, and Canon's HS (High Sensitivity) system to ensure exceptional results whatever the adventure.